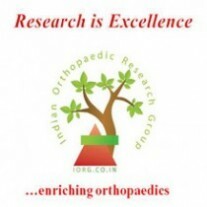 The Indian Orthopaedic Research Group takes great pleasure in announcing the Second IORG Certificate Course in Research Methodology. This will be a Basic Course on Thesis writing and Journal Publication to be held in City of Hyderabad on 25th March 2012. The course is been conducted in collaboration with Sunshine Medical Academy for Research and Training (SMART) and Sunshine Hospitals, Hyderabad. The members of IORG Core Committee and Orthopaedic Surgeons experienced in Research and research methodology will be speaking on various topics starting from basics of thesis selection and execution to conversion of thesis into a successful Journal Publication. This will be a unique workshop for Post graduate residents where they can learn the basic requirements of their thesis and also principles of Journal publication. The course will also include an interactive session where delegates can discuss their individual queries. To facilitate adequate individual interaction with participants we have limited the number of registration for the course to only 50 delegates. The course is meant for post graduate students of all faculty of medicine including surgical, medical and other para and non-clinical branches. Vital research principles & tools to students to perform a scientific research & write a quality thesis. Step by step guidance through detailed sessions for critical aspects of thesis including introduction, review of literature, material methods, results and discussion. Thane [W], Maharashtra, India. Pin – 400604.